Last month, when HTC started taking pre-orders for its U11 flagship phone in the US, it offered customers the chance to get the handset for $50 off the regular price by using various promo codes. We assumed that this was a pre-order offer only, but we're happy to report that the HTC U11 can still be bought for $50 off - thus, you're paying $599 instead of $649 for it. 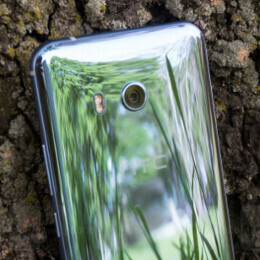 To get the U11 for $599, you have to visit HTC's official US website (see the source link below) and use the promo code AMAZINGU11 at checkout. Apparently, this code is valid until July 1, so there are almost three full days left for you to use it. The code can be applied on the purchase of any HTC U11 color variant, including the brand new red one. However, it looks like the Sprint version isn't included in the offer, as it's currently out of stock. With a very shiny finish and a touch-sensitive Edge Sense frame, the U11 certainly represents a change compared to HTC's flagship smartphones of years past. You can find out more about the handset by reading out HTC U11 review. Wish other carriers have it instead of Sprint exclusive. The solar red color is cool. Too bad the color won't be available in my country. HTC please reconsider. Totally worth it. I've had it for a week and love it. Goes toe to toe with other flagships in all categories but pulls far ahead in the audio department. Great phone. Best flagship of the year, and with that price totally worth it! Still too much for dongle phone (no 3.5 mm jack) with big bezels and outdated desing. $500 could probably be a right price.